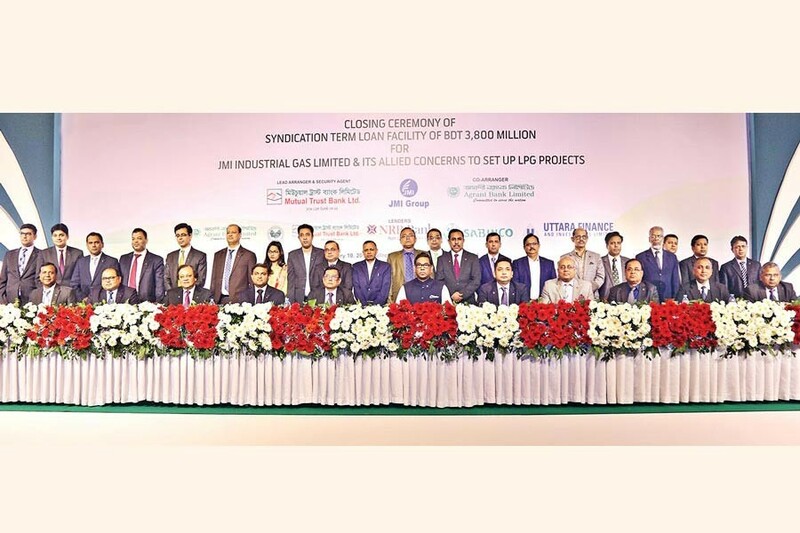 The JMI Group has forayed into the booming LPG business and now looks to grab a significant portion of the market share by utilising investments from foreign and local sources. The conglomerate, having businesses especially in healthcare sector, has initiated an integrated LPG (liquefied petroleum gas) business and the JMI Industrial Gas Ltd. and its allied concerns will implement LPG projects in the country as part of it. To this end, the financial closure of a syndication term loan facility worth Tk 3.80 billion for the JMI Industrial Gas Ltd. and its allied concerns was held at a city hotel on Sunday night. State Minister for Power, Energy and Mineral Resources Nasrul Hamid attended the ceremony as the chief guest. Privately-owned Mutual Trust Bank Ltd. (MTB) is the lead arranger and security agent of the loan facility while Agrani Bank is the co-arranger. Saudi Bangladesh Industrial and Agricultural Investment Company Ltd. (SABINCO), Bangladesh Infrastructure Finance Fund Ltd. (BIFFL), NRB Bank and Uttara Finance are the other lenders. Speaking on the occasion, State Minister Nasrul Hamid hailed the JMI Group for initiating the integrated LPG business attracting investments from home and abroad. He said the country has a 3.0 million tonnes per year (Mtpa) LPG market, but current consumption is hovering around only 1.0 Mtpa. Mr Hamid reiterated the government decision not to provide piped natural gas connections to households in order to ensure efficient use of natural gas. "We want that LPG would be easily available across the country at a reasonable price," he added. Mr Hamid also urged the country's entrepreneurs to set up new industries in the planned industrial and economic zones for quality supply of utilities, especially natural gas and electricity. JMI founder and Managing Director Md Abdur Razzaq said his Group has become one of the fastest-growing conglomerates in the country having support from different foreign countries, especially Japan. Mr Razzaq said he launched healthcare business with JMI Syringes & Medical Devices in the country in 1999 after serving in Japan. JMI Group has brought investments from many countries, including the UK, Japan, South Korea and Turkey, he said. JMI products are now being exported to around 27 countries around the world, he said. MTB Managing Director and CEO Anis A Khan, top officials of lending banks and JMI Group Chairman Jabed Iqbal Pathan also spoke on the occasion. Earlier, the NIPRO Corporation of Japan has expressed interest to subscribe for 11,100,000 ordinary shares of the JMI Syringes & Medical Devices to strengthen further the business footing of the company at home and abroad.